Our PoemTalkers - this time Gregory Djanikian, Tom Devaney and Jessica Lowenthal - gathered to talk about a late poem by John Ashbery, "Crossroads in the Past," from his book Your Name Here (2000). Amid the usual Ashberyean ontological bounty here's a poem that disentangles the crossed lines of narrative middles and ends (and beginnings). Straightens things out, or at least imagines the goodness of such straightness. And indulges in a nostalgia for the way things were at the start. Is it age - or the loss of a loved one - that draws an anti-narrative poet to beginnings at the end? That, in short, is the question we posed of this poem. And does such a thing undermine a career-long devotion to middles with implied pre-stories? The wind blows in the direction it blows, and can't be "wrong." What about a "relationship"? Can - or should - a relationship be talked back to its beginnings, a narrative housecleaning? Jessica and Greg decided finally that the apparently definitive ending dead-ends in an obvious imagery and sentiment. Tom and Al disagreed, seeing the poem as thus a meta-poem: a poem about the poet who has reached a point where he must re-imagine "the beginnings concept" and who realizes its failure. Here is a link to the Poetry Foundation's PoemTalk page. Here is PennSound's John Ashbery page. This page has grown enormously in recent weeks, as PennSound becomes the prime available-for-download repositories of audio recordings of this great contemporary poet. 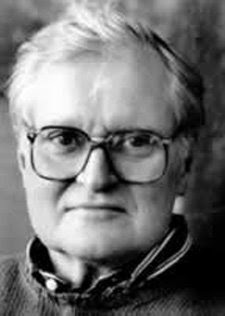 Here is a link to Ashbery's reading of our poem, "Crossroads in the Past." 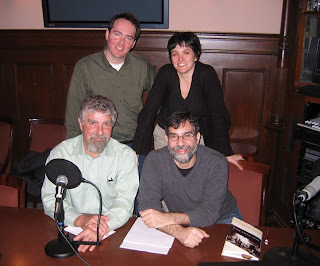 PoemTalk #9 was recorded in Studio 111 at the Center for Programs in Contemporary Writing in Philadelphia. Our engineer-director and editor was Steve McLaughlin. At top: standing from left, Tom Devaney and Jessica Lowenthal; seated from left, Gregory Djanikian and Al Filreis. I think this poems speaks to a point in time where the narrator becomes uncomfortable, uneasy, with a relationship, something is "wrong," observing the stir of the wind and then using it as a subject of seperateness. The thing that is "wrong" now was "wrong" at the beginning of the relationship, the end of the relationship already there, as the "Twilight." Explaining this poem to my daughter, I further say, either with someone or with himself, the narrator is rationalizing or justifying that "it is over." She said, "Anyway,who wrote that poem?" I replied, "Some guy named John Ashberry." She came back with, "Hi, my name is Ruby."